I’m on the play for our opener, having been thoroughly trounced in the pre-game friendly. I open with an Island, while Jimi plays a Boros Guildgate. Next turn I add a Forest, then find a Mountain off of a Farseek. Jimi, meanwhile, adds a Mountain of her own, then a Champion of the Parish. That’s trouble. Now turn 3, I play an Island, then go find a Forest off of a Borderland Ranger. Jimi summons a Doomed Traveler and Firefist Striker, adding a pair of +1/+1 counters to the Champion before turning it sideways for 3. Down to 17, I look to try and marshal some defense behind a Fog Bank after playing the Forest. Jimi adds a Truefire Paladin to her board, giving the Champion another counter. She then attacks in with it, alongside the Traveler and Striker, with the Striker’s battalion taking my Wall out of the equation. This invites a trade between my Ranger and her Striker, but Jimi seems happy enough just to keep me creature-light. Just like that, I’m down to 12 life. Still, I’m hopeful on turn 5 as I deploy a Deadeye Navigator after playing an Island, thinking the substantial 5/5 body could buy me some time. Indeed it does, as Jimi drops a land and passes. Back to me, I spring the trap, summoning a Sphinx of Uthuun and soulbonding it to the Navigator. The top five cards of my library are revealed, and Jimi separates them into two piles. On my left is a Verdant Haven alongside three Forests. On my right is a Gruul Ragebeast. This one’s a no-brainer, and the larger pile heads off to my graveyard. Sadly for Jimi, her next turn is a blank as well. Now turn 7, I summon the Ragebeast to fight Jimi’s Champion of the Parish, looking to kill her best creature. It would have, too, were it not for the answering Boros Charm to save it by giving it indestructibility. I wait for the Searing Spear to even the score, but it never comes, and it proves to be Jimi’s undoing. I attack in with the Sphinx for 5, taking her to 15. Back to Jimi, she summons a Sunhome Guildmage (giving the Champion another counter), then passes. I then kill off the Champion altogether with a massive Ground Assault, then attack for 5 more in the air with the Sphinx. Next I add a Borderland Ranger, grabbing a Forest even as it and Jimi’s Guildmage fight one another to the death. Finally, I use the Navigator to flicker my Sphinx. This sets off a delightful chain of events, starting with another free Fact or Fiction (I keep a Ground Assault at the expense of three lands and an Urban Evolution). Next is the fight trigger from the Ragebeast, which lets me kill off Jimi’s Paladin. Finally, the untapped Sphinx- repaired with the Navigator, of course- is ready to defend if needed. It’s a ridiculous amount of value, and shows what the deck is capable of. All Jimi can manage is another Doomed Traveler. With my ample manabase, I flicker the Sphinx two more times, fighting and drawing cards all the while. Though Jimi does manage to get me to 6 thanks to a Boros Charm and Pillar of Flame, it’s a gesture of defiance and no more. Jimi begins with a Mountain, while I fetch one of my own off an Evolving Wilds. Next turn Jimi finds the game’s first creature in a Truefire Paladin, while I ramp courtesy of a Farkseek. Next turn Jimi adds a Skyknight Legionnaire, attacking across the red zone for 4. I play more land and pass. Now turn 4, JImi plays a second Legionnaire, swinging for 6. 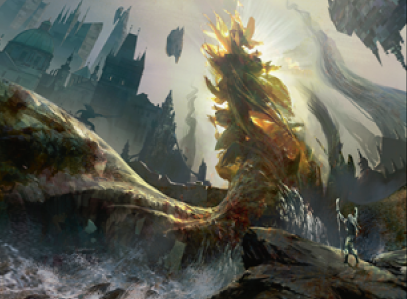 I drop an Island, then play a Simic Guildgate after casting Urban Evolution for some extra cards. A next-turn Lightning Mauler, soulbonding with the Paladin, sees me smashed for 8 points of dagame, down to 2. Back to me, I’m able to stabilise with a Fog Bank, Strangleroot Geist, and Verdant Haven on a Forest for a couple extra life. For all the good it does me, anyway. Jimi simply kills me with a Boros Charm. On the play, I again use an Evolving Wilds to grab a Mountain, while Jimi deploys a Champion of the Parish off a Plains. Next turn, I simply kill it outright with a Ground Assault, while Jimi replaces it with a Truefire Paladin. 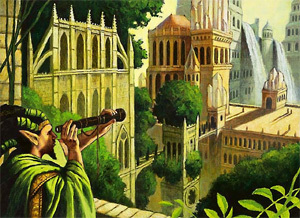 Now turn 3, I stick a Verdant Haven on my Forest, going up to 22 life. Jimi plays a Lightning Mauler, soulbonding it to her Paladin and attacking in for 4 with the pair. Thanks to the ramp, I’m able to summon Thragtusk next turn, going up to 23. Jimi attacks in fearlessly, and I let her creatures through for 4. She then adds a Doomed Traveler and ends the turn. Now turn 5, I attack with the Thragtusk, compelling Jimi to block with the Traveler. It dies, and she replaces her loss with a 1/1 Spirit token. I then play an Arbor Elf, before Bramblecrushing Jimi’s only Plains in an attempt to slow her down. It closes out White, but when she topdecks a Plains to replace it it’s business as usual. She then attacks with the Paladin for 2, ending her turn with me down to 17. When Thragtusk attacks in on turn 6, Jimi roasts it with a Searing Spear. It heads to the graveyard, leaving behind a 3/3 Beast token. I then tap my Forest with the Haven attached to it for two mana, then use the Arbor Elf to untap it for another use- wringing eight mana out of my six lands. I use it for a Borderland Ranger (fetching an Island) and Urban Evolution (playing that Island), before ending my turn. For her part, Jimi summons a Skyknight Legionnaire, attacking in for 3 with it and the Spirit token. Now turn 7, I kill her Paladin when I bring out the Gruul Ragebeast, then Farseek for a Forest and send in the Beast to score my first points of damage. Jimi then Gathers the Townsfolk, giving her a pair of 1/1 tokens. After attacking for 3 more in the air, she ends her turn. Back to me, I swing for 9 with the Beast and Ragebeast. Jimi chumps the 6/6 with a 1/1 token, gang-blocks the 3/3 with her Mauler and other Human token for a trade- then snaps off a Boros Charm for indestructibility. My Beast dies, though, and all I have left is to Farseek for an Island. Over to Jimi, she adds another Legionnaire and counterattacks for 5 in the sky, leaving me at 6. A turn 9 Borderland Ranger kills off one of Jimi’s Legionnaires, thanks to the Ragebeast’s encouraging presence. An attack with the Ragebeast isn’t as successful, though, as it gets chumped by a 1/1 Human. Back to Jimi, she cuts me in half with her Legionnaire and Spirit, then adds a Doomed Traveler. Drawing nothing, I scoop. Impressively, Jimi played the entire game with only four lands. I wasn’t sure what quite to expect from Thrive and Thrash, considering the pelters it seems to have taken from the community. It seems almost inevitable now that one Event Deck is rated far higher than the other, a factor that has been put forth as an explanation for why the product line will be shrinking down to one deck per set beginning with Dragon’s Maze. Sure it had Thragtusk, but from there public opinion didn’t seem to rate it very highly. By the same token, the results from today’s match don’t exactly cover the deck in glory, either. Of the four we played, including the customary pregame friendly, Thrive and Thrash won precisely one of them. Given the calibre of the opposition it faced in the rapidly-deploying Rally and Rout, that may not be surprising, but it’s not as if Thrive and Thrash was entirely unprepared, either. There’s the Thragtusk, of course, but other cards seemed custom-tailored to counteract an aggressive attacking strategy. Fog Bank stops any attacker cold, and demands a burn spell to solve it. Strangleroot Geist’s undying makes it a wonderful defensive threat, with the potential to take two cards with it to its final rest. Even the lifegain of Verdant Haven could help top up an emptying tank. By the end of the match, it certainly didn’t feel like a blowout, which is what we were wary of. Indeed, it felt at times like they could go either way in this often-seen matchup: one deck looking to win early, the other to weather the early storm and win late. If the Boros were able to more consistently hit their targets than the Simic this time around, it was somewhere between unfortunate and unlucky. The playset of Flames of the Firebrand in the sideboard certainly beckoned here, but as per our custom we duel with maindecks only. So the fundamentals of the deck are sound, if perhaps slightly less sound than Rally and Rout. The manabase development package seemed to pay off as much in consistency (hitting a drop each turn) as in acceleration (hitting multiple drops a turn early), and I never really felt that my cards were uncastable, even at the premium cost some of them command. This was the deck’s strongest consistent characteristic. Beyond that, it was up to the deck’s large closers to set the tone of the match. The Gruul Ragebeast was a killer, though it did feel that by the time it turned up, a lot of the creatures in your hand were already on the board. The Deadeye Navigator is an inspired choice, not least because of its massive size but also due to the number of combos it could enable, as seen in the first game. Although I would have liked to have a little more say in what went on on the other side of the table, I can’t slate the deck too harshly considering the recourse in the sideboard. Finally, the entertainment factor of the deck was definitely here. The ramp-to-win strategy served the deck well, and I always felt that I had at least a chance against Jimi, and with the right cards perhaps more than a chance. The combo shenanigans I pulled off with the Navigator in our opener were an absolute joy, and I can imagine flickering an Acidic Slime to erode her manabase would have been every bit as satisfying. I remain skeptical of how well this would do in a competitive Friday Night Magic situation, seeing it as decidedly lower-tier, but there may well be some potential for greatness here. There’s certainly potential for fun. I love the flicker mechanic in these recent sets. I am making my own version of this deck that uses Prime Speaker zegana as a good soulbond target for the Deadeye navigator. With all the ramp that this deck provides, it is really fun to start drawing absurd amounts of cards really quickly. However I feel that this deck could really use more deadeye navigators, as so many cards rely on flicker to be at maximum efficiency, i.e. Gruul ragebeast, Sphinx of Uthuun and of course thragtusk. It’s a real shame that it will only be one event deck per set now. I always liked the choice of one strategy over another. In 2013, I like that it represented both the graveyard mechanics of the Innistrad block, and the Flicker mechanic that they wanted to encourage. 2 event decks per block, I shall miss you. Excellent review. It makes me interested in trying the ‘Simic’ deck with slight modification. Maybe adding another Navigator and a couple Thragtusk, complemented with Cyclonic Rifts and Clan Defiances, to give the deck another possible destination for the bridge it build. Btw, you picked a Forest with Farseek on Game 3. Surprised you found synergy in a deck that was otherwise dismissed a pile of “good stuff,” but I suspect most players online don’t looking too closely at per-constructed decks anyway (me included). If there was one event deck per set, maybe it can go against itself, or go against the previous event decK? We’ll be doing like we have with the PDS line, which is testing it against a previous iteration. So the DGM deck will go up against either the Simic or Boros one from GTC. Not ideal, but close enough. I’m a bit disappointed that it doesn’t seem as well balanced against the Boros deck. yes you say it didn’t feel like a blow out but 1 for 4 is not a great track record. Perhaps this is the deck to meddled with. Oh well Great review in my opinion. Quite right! The Simic deck definitely felt like a tier down from the Boros one. They’ve not been balanced against one another, so sometimes there’s just a clear favourite. They’re more meant for attacking a broad swathe of the meta rather than providing a ‘duel deck’ experience. Jay, hindsight is 20/20, but does the deck ratings process need to allow for some “user error” for lack of a better term? In game 3 doesn’t it seem in hindsight that you could have blocked one of the two attackers with your Thragtusk in turn 4? It would have saved you 2 life in turn 4 and probably another 2 life in turn 5 if your opponent persisted in holding back her Mauler (assuming that the Mauler had survived in turn 4). With the mana advantage that you ended up having, wouldn’t you want to prolong the game rather than letting in enough small early bites add up to a defeat? The end result seemed sick/wrong (how does a deck that yields 8 mana in turn 6 end up losing to a deck with only four lands?) and I’m still not sure I’m on the right track. Many sports playoff series go best of 5 or best of 7. Even though MTG matches go best of three, it would seem like deck evaluations/comparisons could afford to go best of 5 or 7, to attempt amelioration of both luck of the draw and piloting decisions that turn out wrong (my son and I sometimes play “alternate ending” to see the impacts of a late decision on a match). After all, mileage can vary from driver to driver as well! Another thought: have you ever tried letting each deck select its own preferred starting hand out the gate, and then shuffle the rest of the deck to introduce the randomness element? It might work well for evaluating decks head to head. Regardless, thanks and keep up the great work. These are some great comments, I appreciate you taking the time to ask them. It’s always a balance for us, in all things we do here. For instance, we have to balance the need for a thorough experience of each deck with the schedule we have (one article every 48 hours) and the time available. Do I feel as comfortable with three games as I would with six? With nine? Twelve? No, but between the deck analysis, the friendly, and the three following matches, it’s enough to get a good sense of the deck. Believe it or not, a deck’s win/lose performance matters a lot less than you’d think to its final rating. There’s that idea of balance again- what about favourable/unfavourable matchups? Is it fair to judge a Red deck harshly if it happens to find itself up against a deck with a bunch of Red-hosing cards like Silver Knight? Again there has to be room for nuance, so I don’t tend to be too harsh on the results. That said, a bad deck -will- usually do poorly, but then it gets judged for being a bad deck… in other words, what made it bad, not the actual results that proved it. Does that make sense? This covers over a number of sins, including the occasional misplay. When I shuffle up a deck for playtesting, I’m really looking to see how well it can accomplish what it’s trying to do in the first place. Like you and yuour son, I’ve even made “what-if” play decisions to see what a certain line of play might be capable of, particularly if I’d already tested out the first line of play. As for the Thragtusk example, I’m not 100% sure on my recollection but as I remember I didn’t want to risk trading out the ‘Tusk that turn for a weenie creature and a burn spell. I definitely agree that it’s painful to lose to a deck with half your manabase, but we can chalk that up to the power of Boros as well- givem them two Mountains and a Plains, and they’ve got all they’ll need for an explosive start. Plus, all the mana in the world counts for little if you have nothing effective to cast with it. I’ve thought about the “pick your opening hand” idea before in the context of the Pro Tour as a lark. I’m not sure it would work here, for a couple of reasons including time and playskill, but also that great leveler, variance. Some decks are designed to be “feast and famine” decks, capable of explsive chains of plays every now and again but very inconsistently so. That inconsistency is part of the deck’s balance, and by letting them do an end-run around it they gain an advantage over their more “slow and steady” competitors. I wouldn’t envy anyone squaring off against Graveborn, for instance, when the first seven cards are pre-picked. Jay, you are exceptional at providing courteous and informative responses to these posts. Kudos to you for going above and beyond, to a place where most other authors would rightfully aspire to be. You are a great ambassador for Magic, particularly with those of us who are just starting to skim the surface and wonder at some of the intricacies below. Well done, sir, and thanks much. Happy meddling! High praise indeed! Many thanks, Dave, I know if it wasn’t for the community’s reception, the site would be nothing. We’ve never lost sight of that, and it’s a wonderfully humbling thing to log in each morning and see how many people have been here. Hello there, I know a bit too late on comments, and i consider your reviews are the best!. Now I was looking those comments and I found an easy way to improve your deck when you loose your first matches: Why you just don’t …sideboard?. The deck themselves have very nice cards to throw in and even up the matches. We would see if you can turn around the situation ? Hi Manel, thanks for the high praise!! The sideboarding issue is one we consider often. I think were we able to get more matches in for a review that’s a route we’d look at. As it is, though, it helps get a sense of the core deck if we leave it as-is. With only a small number of matches, lucking into drawing you sideboard hoser could sway a match unduly, and leave us less able to assess the deck on its own merits.